On July 4, 1968 I stood in a reception line at the State Department in Washington, D.C. and shook the hand of then-Secretary of State Dean Rusk. I was a summer intern with the United States Information Agency (USIA) and we had all been invited to a diplomatic reception to celebrate the holiday and watch the fireworks display over the Washington Mall. The Vietnam War was raging and, upon meeting him, I identified Rusk only with the Lyndon Johnson administration and our involvement in Vietnam. It was only three years later when I arrived in Korea that it occurred to me that I shook hands in 1968 with one of the two men who, in a hasty meeting after World War II, decided to divide Korea at the 38th parallel. It was Rusk who, along with Colonel Charles Bonesteel, decided to provisionally establish that dividing line between the North, which the Soviet Union would occupy and the southern U.S. zone which the US would enter. The Cold War later solidified that division into the tense military confrontation at the demilitarized zone or DMZ. From the time I shook Dean Rusk's hand in 1968, right up to the present, the DMZ has been understood by the world and portrayed by its media as a potential military flash point and a prominent vestige of the Cold War. That portrayal underlies the appeal of the DMZ tours that have proven so popular with visitors to Korea over the past several decades. From this point in cyberspace (or "in this blog"), I will make the argument that understanding Korea's DMZ in military or Cold War terms is an anachronism. In point of fact, the major historical significance of the DMZ is now as the world's most prominent digital divide. 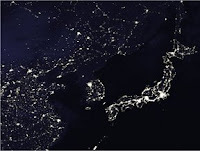 It divides the world's most highly networked (both wired and wireless) nation from arguably the least networked country--keeping in mind that Korea is actually a single nation, although tragically divided. The photograph above captures the lack of electric power in the North versus the South, but it mirrors dramatic differences in every measure of a modern economy. South Korea has become one of the world's leading economies, primarily through progress in information and communication technologies. That fact alone has much to do with its future, both in terms of national reunification and Korea's future role in the region and the world. More on this topic in future posts.